The following analysis is courtesy of the Bocconi Students Investment Club (BSIC), the oldest and largest student organization in Bocconi University that aims at promoting a wide variety of finance related activities outside the classroom to the Bocconi community. On April 13th, 2017, Fininvest has publicly announced the full execution of the agreement signed on 5 August 2016, which envisaged the transfer of Fininvest’s entire stake in AC Milan, equal to 99.93%, to the holding Rossoneri Sport Investment Lux, represented by David Han Li and Yonghong Li. AC Milan has been valued at an EV of €740m, with total Net Debt of approximately €220m. The football industry is surprisingly quite small in terms of capitalization, so much that the cumulative EV of Europe’s 32 largest football clubs is less than half of Nike’s. The reason is to be found in the managerial objectives of football teams, which have historically been more oriented towards on-the-pitch success rather than growth and financial solidity. However, the globalization trend and technological advancement of the last decade has made European football accessible to supporters from more remote geographic areas, such as Asia and South America, transforming the industry in one of the most promising and fast growing of the old continent. The cumulative turnover of the 20 largest clubs in Europe has been steadily growing since early 2000 and Deloitte estimated an average growth of 12% only in the last year. Manchester United has arguably been the team that best responded to this trend, attracting lots of new supporters and emerging as clear winner of the post globalization era, stealing the crown of largest football club by revenues to Spanish and Italian teams (Manchester United Revenues amount to €648m). The revenues of football clubs can be split in three fundamental categories, Matchday Revenues, Broadcasting Revenues and Commercial Revenues. Depending on the geographic area, brand’s strength and commercial development of the team, each of these categories can play a more important role with respect to the other two. Despite the extraordinary growth that the industry as a whole is experiencing, Italian clubs are emerging as clear losers in the new environment of worldwide soccer. Obsolete stadiums, violent supporters and reiterated mismanagement have gradually decreased the interest for the Italian top league, Serie A, with a resulting decrease in Italian teams’ revenues. As of today, only Juventus is consistently ranking among the ten richest European clubs, while FC Inter and AC Milan have been experiencing a constant decline in turnovers, and have not yet been able to revert such trend. Valuing a football club is indeed a very complex task. As mentioned above, the management teams generally undervalue the importance of positive financial results, and very few European clubs can actually claim to have positive earnings, along with a quotation in a major stock exchange. For this reason, identifying the correct margin for a multiple valuation, like EBITDA, may prove to be very difficult, while the earnings per share indicator loses significance because of the aforementioned reasons. A DCF valuation, on the other hand, while theoretically correct, may prove complex to implement due to the large dependence of cash flows on sport results, which are in most cases obviously hard to predict, even for the most resilient financial analyst. The most widespread valuation methods appear to be the Price/Sales or EV/Sales multiples. Despite the inability to correctly capture the profitability of a company, revenue multiples seem to be the universally most applicable and easily traceable multiples within this context. FC Inter, one of the two most famous Milan-based football clubs, has reported in a press release that past acquisitions’ Price/Sales multiples were used as benchmark in valuing the club during the course of the recent transaction in which it was involved. Similarly, KMPG has published a paper where it supports the validity of the EV/Sales multiple in this context. Associazione Calcistica Milan is a Milan-based football club founded in 1899. Considered as the second most titled club of football history, AC Milan has been owned and de-facto run by Italian businessman Silvio Berlusconi for more than 30 years through its holding company Fininvest. In spite of the glorious history on the pitch, AC Milan was never able to produce a single euro of profits but for 3 years during Berlusconi’s reign. In 2015, the company reported a loss of €90m that is set to be matched by 2016 full-year results. Deloitte estimates AC Milan’s revenue to be around €215m (FY2016), an 8% Y-o-Y increase, due to the fact that the team was able to reach the final of Coppa Italia. The current revenues of the team, however, are far from the peak of €263m recorded by the club in 2013. The revenues are divided in Matchday, Broadcasting and Commercial inflows which account for respectively 12%, 41% and 47% of the total. The disposal of AC Milan and Mediaset’s pay-tv (Mediaset Premium), are part of a larger strategy implemented by Fininvest to resume to profits by selling the most burdensome businesses of the conglomerate. Rossoneri Sport Investment Lux acquired from Fininvest 99.93% of AC Milan shares, valuing the business at an Enterprise Value of €740m. The parties agreed on valuing AC Milan’s net debt €220m, for an estimated Equity value of €520m. The implied EV/Sales multiple (based on 2015 revenue) is about 4.1x, while the implied Price/Sales multiple (also based on 2015 revenue) is about 2.9x. Fininvest also received a €90m reimbursement relative to capital contributed by Mr. Berlusconi’s holding company to AC Milan after July 1st, 2016. Mr. Li’s investment vehicle signed a preliminary contract with Fininvest in August 2016 and immediately paid the first €15m of the €100m deposit. The remaining €85m were paid in September 2016. Then, in December 2016 Fininvest received the second €100m tranche of deposits. Calcioefinanza.it reported that Hong Kong-based Huarong International Financial Holdings anticipated the money via Willy Shine, a British Virgin Islands-based holding company. The loan was secured by Mr. Li’s net worth in China, which consists of participations in several local building and packaging companies, worth in total about €500m. In March 2017, Fininvest expected to receive the third, and last, €100m deposit before the closing. Sky Sport Italia reported that actually Rossoneri Sport Investment Lux paid, few days late, a total amount of €50m, in two different tranches worth €20 and €30m respectively. According to Calcioefinanza.it, this money came probably from Mr. Li’s offshore funds owned by the vehicle Rossoneri Advanced Company Limited, based in British Virgin Islands. Mr. Li transferred the money to Luxembourg, via Hong Kong, and then paid Fininvest. The Chinese entrepreneur guaranteed that he would have paid the other €50m directly on the closing day, which, at that point, was delayed to April 13. On April 13, Mr. Li’s vehicle made the final €370m payment to Fininvest and officially acquired the ownership of the red and black football team. American hedge fund Elliott Capital, supported by London-based private equity fund Blue Skye, financed €180 of this final payment through another Luxembourg-based ad hoc vehicle called RedBlack Sarl. Calcioefinanza.it reported that Huarong International Financial Holdings has financed about €140m of the remaining €190m, along with Mr. Li’s offshore funds, worth about €50m. Elliott Capital is going to be a very important actor in the immediate future of AC Milan. The American hedge fund has in fact financed Rossoneri Sport Investment Lux in two tranches. The aforementioned one, worth about €180m, financed the final payment to Fininvest on the closing day. The second part, worth about €123m, is instead issued directly by AC Milan. In particular, €73 of these will pay back some bank loans, while the other €50m will be a capital contribution to strengthen the club. Milannews.it and Gazzetta dello Sport reported that the applied interest rates are 11.5% on the first €180m issued by Rossoneri Sport Investment Lux, and 7.7% on the other €123m. Overall, Elliott Capital will get roughly €30.2m in annual interests, about €20.7m of which from the loan issued by Mr. Li’s Luxembourgian vehicle, and the remaining part, about €9.5m, from AC Milan’s loan. According to website Goal.com, Mr. Li has also been charged an arrangement fee worth about €15m. The maturity of the loans is unclear. The initial indiscretion reported an 18-month maturity. However, Italian journalist Pasquale Campopiano revealed that the term should be actually 5 years, at least for the €123m issued by AC Milan. Anyway, Gazzetta dello Sport reported that in case of default on the reimbursement of these loans, Elliott would be able to get the money back forcing Rossoneri Sport Investment Lux to sell its AC Milan’s shares. Meanwhile, Elliott is going to control strictly AC Milan’s financial accounts every two months. In fact, through managerial reports and meetings with the management, Elliott will be able to get information about variances between budgeted and actual accounts. The hedge fund has also created an ad hoc committee to control the financial results. Furthermore, Mr. Salvatore Cerchione will be in AC Milan’s Board of Directors with the role of observer in the interests of Elliott. Another trusted figure, Mr. Paolo Scaroni, former CEO of ENI and currently Deputy Chairman of Rothschild, will also be part of the board. Finally, UEFA’s financial fair play policy represents a key concern regarding potential future revenue for the red and black football club. According to these rules, a club would not be allowed to take part to European club competitions, such as Champions League and Europa League, if it recorded cumulated losses larger than €30m over the latest three financial years. AC Milan has already reported about €180m total losses in FYs 2014 and 2015, and, according to Goal.com, will probably report an additional loss of about €70m in 2016 Financial Statement. However, the club has already presented to UEFA a request for the admission to voluntary agreement. Through this procedure, UEFA can allow a club with a new property to derogate from the aforementioned financial fair play parameters. The required condition is the presence of a credible 3 to 5 years business plan, which shows how the club will be able to raise revenue and reduce losses. The deal is included in a broader context of Chinese-led M&A activity in Europe, which is driven primarily by the need to find profitable investment opportunities outside of the domestic boundary. Moreover, the soccer industry in China is undergoing a substantial expansion, with growing numbers of fans and more and more valuable TV rights. 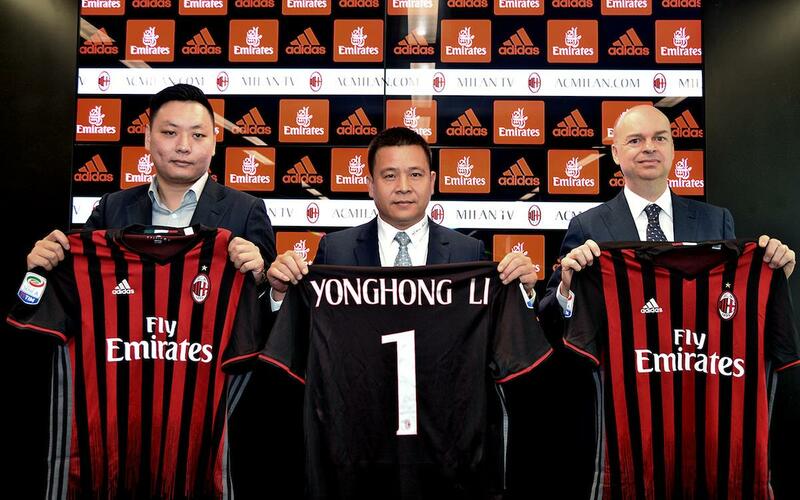 Mr. Li will seek to increase revenues through merchandising, and will benefit from the exclusivity on the TV rights for AC Milan’s games in China. Moreover, there are great opportunities for turning around AC Milan, which has posted a net loss in their operations the past year. In order to compete with the other top football squads in Europe, AC Milan needs substantial investments, in particular with regard to the acquisition of new players. Therefore, the capital injections announced by the Mr. Li might return the club to its former success and improve the financial performance of the club. From the standpoint of former Chairman Mr. Berlusconi, the underlying rationale for the sale of the club he led through the victory of as many as 29 trophies appears to be that of a succession problem. In fact, it was Marina Berlusconi, daughter of Silvio, who pushed for initiating talks with Chinese investors that ultimately culminated with sale of the club. As noted above, AC Milan has been consistently recording losses, as well as delivering poor results from a purely sports, non-financial standpoint. The club needs a medium term business plan and considerable investments in order to return to its former glory. Berlusconi is getting old, and his sons do not seem to be willing to commit further capital to a loss-generating business. Fininvest has been advised by Lazard and BNP Paribas, whereas Rossoneri Sport Investment Lux was advised by Rothschild.